1. Folded Cards. These are also known as our classic Greeting Cards: simple cards printed from your photos, and nothing else. We offer four sizes on our website and app Print Studio. They can be printed full-bleed or with your photo cropped to a square. 2. Flat Cards. These are 5x7 flat cards with designs that you can add your own photos and text to. We have designs for holidays, thank yous and save-the-dates, exclusively available directly from our iOS app Greetings. You can download our app Greetings for free from the App Store. It works for iPhone and iPad and there is no sign up required. Browse your card options in Greetings. We offer tons of season-specific designs. Then choose your favorite card and customize it, adding your own photos and text to it. Tap the magnifying glass button and then the arrow icon to download your card to your Camera Roll. 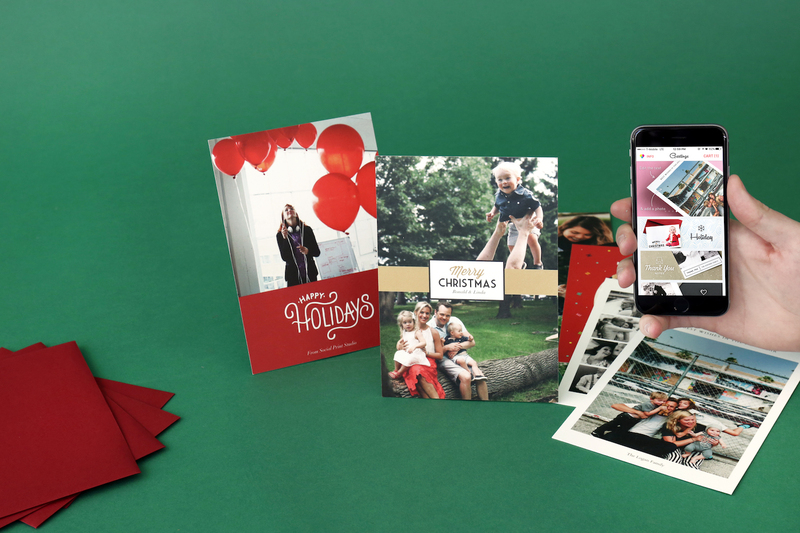 Now your card design is saved on your iPhone or iPad's Camera Roll, you can print it out on a set of Greeting Cards in our app Print Studio. Just open Print Studio and select Greeting Cards! The designs were made to be printed at 5x7, so choose this size for optimal text size. Pro tip: You can print as many different designs as you like in a set, so feel free to make multiple custom designs! 1. First, download our designs. We've put together a ZIP file of some of our simplest designs for you to customize yourself. On PhotoShop - Open the design you like in PhotoShop, then go to File > Place and select the photo from your computer you'd like to use on your image. If you have a template with space for multiple images you can place multiple images. Adjust the crop and size of your image until you're happy then go to Save As and select the file-type as a JPEG. On the web Use this free tool PineTools to combine your two images. Then download your image to your computer. 4. Upload your final image for printing on our website! Here's a list of the resources cited in this article. ♦︎ Greetings App for iPhone and iPad. ♦︎ Print Studio App for iPhone and iPad. ♦︎ Greeting Cards on our website. ♦︎ Greetings Designs Zip to download and use. ♦︎ PineTools to overlay images online.